Interstate highways are deceiving. One of the best examples is the Interstate 5 stretch between Sacramento and Redding, California. Just 162 miles separate the two cities, but the drive appears to be flat and unremarkable. Most RVers get through it quickly but now there’s a reason to stop halfway and go camping in Orland, California: The Parkway RV Resort and Campground. Shady and green, it’s an I-5 oasis. Until now, camping in Orland was limited to Black Butte Lake, a U.S. Army Corps of Engineers project. People who wanted a more luxurious experience were out of luck and moved on to bigger cities along Interstate 5. But 12 years ago a family of eight from Folsom, California saw the possibilities in an old derelict campground located a half-mile from the interstate. After years of hard work, The Parkway RV Resort and Campground is more than a one-night stopover. It`s a great area to stay for a few days with its full service amenities, quiet grounds, and series of recreational activities. So, when guests pull into the idyllic park they leave behind loud freeway noise and re-connect with nature. 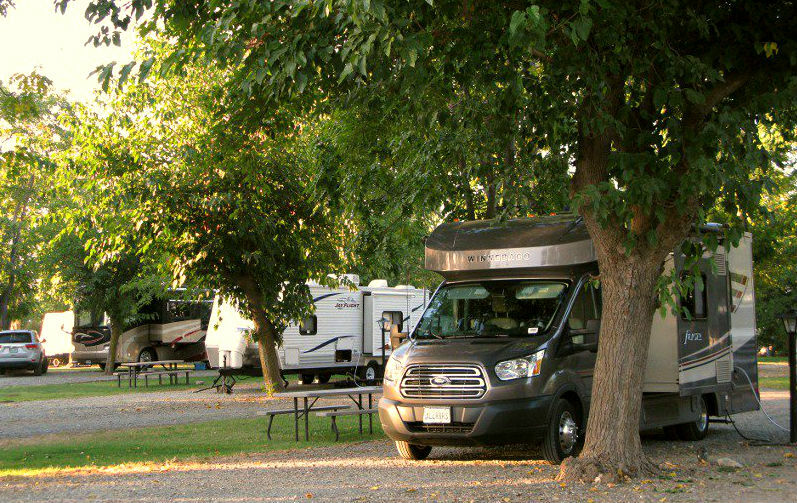 Mature shade trees, lush landscaping, and very spacious RV sites, greet road-weary travelers. A lovingly painted office mural invites RVers to step inside and enjoy an amenity out of the ordinary, an on-site wine tasting experience featuring local selections and artisan cheeses. “It’s changed a lot from when we bought it to today,” explains John Smutny, a retired techie from Intel. When he and his wife Marian bought the park it was in such bad shape that friends, family and even RV industry advertising reps asked them, “Are you nuts?” They weren’t. Something about the 10-acre property told the couple it was their destiny. “There was an energy, it was just kind of a beckoning,” Marian recalls. 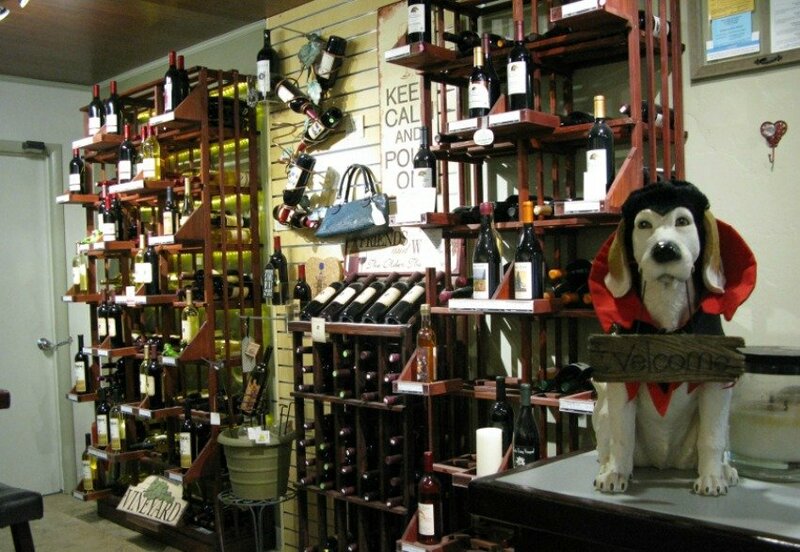 Local wines, cheeses and gifts are showcased. 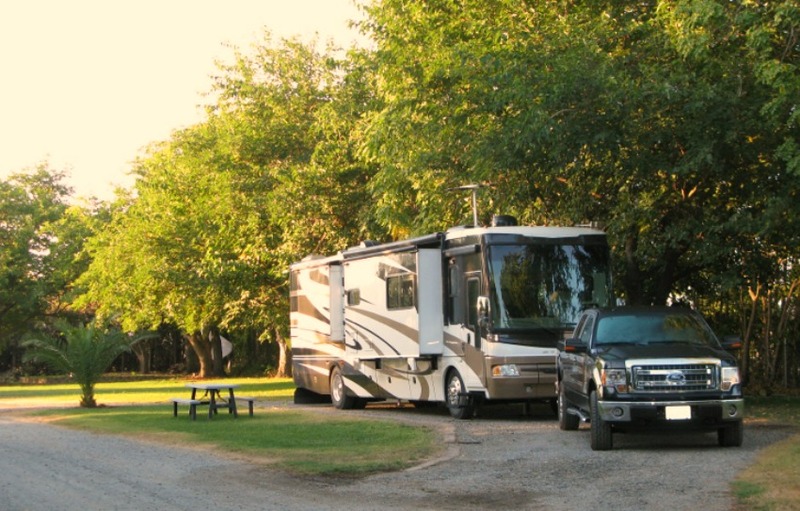 As RVers and savvy business executives, the couple spent years researching RV parks. For instance, they took cross-country family vacations that allowed John, Marian and their six sons to refine the family vision for their own park. Further, as the family went from coast-to-coast, each member explored campgrounds and reported what they liked and didn’t like about facilities, layout and amenities. Additionally, during their travels, the family went to several parks to discover certain aspects of what they didn’t want their park to be. As a result, as more people learn about The Parkway, they discover that RV camping in Orland, California lives up to its promise. Extra-long pull-through RV sites await big rigs. What’s more, the Smutnys are thrilled with transformation and they’re equally as proud of how they run the property. Every family member has a personal investment in the happiness of guests. “We’re not managers, we’re owners. We have a vested interest in this place and want to see it succeed. We want it to be different, a place that I would like to come to,” says Marian. Consequently, if Campground Reviews is any indication, The Parkway is the best reason to exit I-5 in Orland (exit 619). “We rely a lot on instinct and feeling. That’s why we bought the park. It was instinctive, it was energy, it was feeling” says Marian. Especially relevant is the fact that their feelings are paramount in how they ensure all guests have a great experience. Considering the number of return guests, The Parkway is a great reason to visit this stretch of California’s Central Valley. I have used this place a couple times and will do so again many times. I travel from Redding to Sac quite freuently. I have stopped here for the night when flying in late at night and don t want to do the whole drive or I can leave Redding late and stop here for a very early flight. Its nice to get half the drive done. Managment is very accommadating. I just pull into the campers section with lawn, electricity and a table and sleep in my van. Bathroom swimming pool awesome. Take the time to pull off the highway and check this place out. Sleep in your car where it is safe, camp for the night or bring in the RV it is a place for all travelors. We’ve stopped here several times. A friend was living in Orland temporarily and we stopped at Parkway to visit her in town. We return anytime we are heading north from Riverside or home from the northwest. We fell in love with the place. Quiet, peaceful, big spaces, lots of shade trees and the Smutnys are fabulous hosts. Hosts is the right word, you’re a guest at Parkview not just another customer. Don’t miss the wine and cheese at the office or any of the restaurants in town. The best place to eat is Farwoods and you would be hard put to find a better restaurant in San Francisco, LA, or New York. Great place to stay, if only the city would quit blowing the air raid siren every time they have a call for the fire department. I stayed here for my “first excursion” practice run with my 5th wheel in July 2017, found them on the internet and I liked their “story”. Then in October, 2017 the fires in the wine country of California came close and my town of Middletown was given an evacuation advisory to be ready. I lost everything in the Valley Fire September 12, 2017 and decided to pack up my new 2017 34′ 5th wheel with some things I couldn’t do in the Valley Fire and head out and wait. I took a chance and went up to Orland to stay and was able to reserve a spot staying 5 days until the advisory was lifted. This park is peaceful, small yet spacious and you are left alone. The quietness and calming atmosphere of this park is wonderful and invigorating. I would highly recommend this place for any reason. I will be back for sure!!! This would be the perfect stop over when I head for Oregon. articles on line are great! I just wish you would still have your magazine being published. I looked forward to receiving it in the mail.